In some cold-weather climates, fall tends to be the most picturesque season. Entire swaths of forest turn vibrant, fiery colors, creating a varied landscape of red, yellow, orange, and brown leaves across hillsides and valleys. But if you’re hunting for views of luscious foliage, when is the best time? Peak colors emerge at different periods in the fall, and there are entire road trips planned around the country’s best fall foliage. SmokyMountains.com, a guide to the Great Smoky Mountains National Park area in Tennessee, has this foliage prediction map, which will tell you if your ideal fall destination will be at its most vibrant in early September or early November. If you’re heading to the Smokies, best to wait until late October, but New York and the Rockies peak earlier in the month. The map above is for the week of October 3. 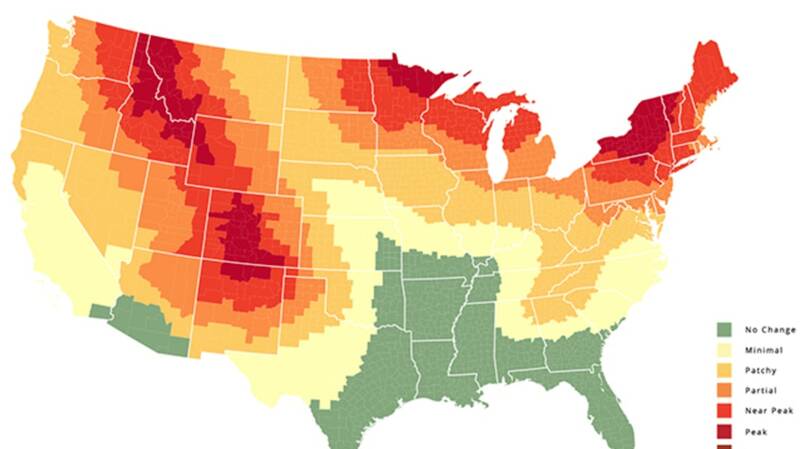 Check out the interactive foliage map here.